Our chosen play was 'A Midsummer Night's Dream'. We read the story and learnt the names of the characters - we thought they were very funny! We acted out the play and used costumes and instruments to make it even more fun. We made our own fairy crowns, we made forest pictures using natural materials, we made fairies and fairy wands. We also learnt that fairies love gifts so we made flower perfume for them using petals. We wrote notes to go with the perfume and we left it in the Reception garden. The next day, the fairies wrote a note back to us and we learnt all about the different things they like - we found out that fairies love clean and tidy places so we have made an extra effort to tidy up this week! We learnt some of the different phrases that Shakespeare created. The children absolutely loved learning about Supertato and Evil Pea. We had great fun acting out the story and playing the parts of different characters. We had to search around the classroom to find all of the evil peas that were hiding. We used tweezers to pick up all of the peas and see who could get the most in their bowl in 1 minute. We used potatoes to print pictures and make stories. We made our own super veggies by decorating different vegetables. We made superhero cuffs using sequins, feathers and crayons. We planted seed potatoes with Duncan today. We learnt all about seed potatoes and how they grow. Pancake Day was a great success! Everyone’s favourite part of the day was making the pancakes! We had to look at the recipe, measure the ingredients and mix them together. We then used the microwave to cook our pancakes! We finished by adding our favourite toppings. We also made playdough pancakes and flipped them in the frying pan, we practised our adding with pancake toppings and matched sums to the hidden answers in our sand tray. We used different materials to create pancakes and we also designed our perfect pancake and wrote about them. We have been busy creating superhero masks at home with our families. Can you guess our superhero names? 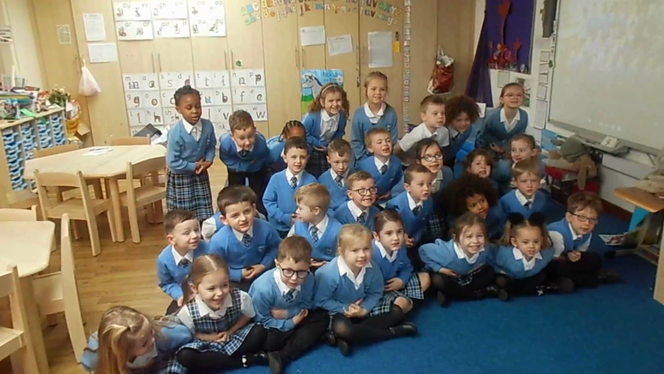 Reception have had some great fun so far this half term. We were not able to go outside for a few days due to the bad weather so we brought the snow inside! The children had great fun making snowmen, cakes and ice creams and loved using different resources from around the classroom to add to their creations! The children also had a fantastic time during number day. We made Numicon biscuits by pressing the shapes into biscuit dough. Once they were baked, we used coloured icing to decorate them in the correct colours and counted out the correct number of chocolate buttons to make the correct number of holes on top. 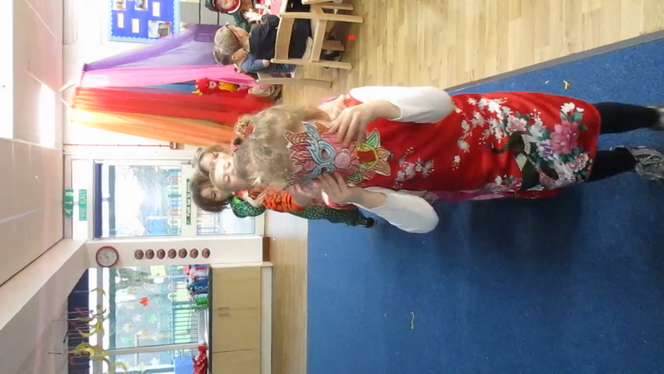 Reception had a great day celebrating Chinese New Year with Nursery. We made Chinese cherry blossom fans, painted numbers in the sand, wrote Chinese New Year cards, made dragon masks, wrote our names in Chinese, made 'Year of the Pig' cupcakes and used chopsticks to eat pretend noodles and dumplings! 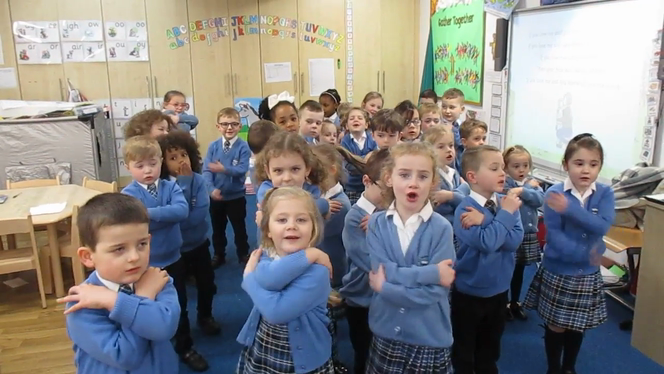 We even did some dancing to Chinese music and some of us made up a dragon dance! Today we learnt about Children's Mental Health Awareness day. We passed smiles around the circle to our friends, we listened to each other speak about how they felt today, we did a yoga session to help us have a healthy body and a healthy mind, we sorted healthy and unhealthy foods and we drew pictures of healthy plates of food. We also learnt a new song called 'We are special'. We learnt about St. Valentine and why we celebrate Valentine's Day. The children made cards, playdough cakes, love potions, 3D shape castles full of love, sequenced heart numbers and matched numbered hearts with the correct number of spots. The children also made their own piece of toast, cut out a heart shape and spread it with jam. Yummy! During the second half term of Autumn, we have been learning about different festivals and celebrations and why they are celebrated. We have looked at Bonfire Night, Remembrance Day, Diwali, Weddings and Christmas. We have had a great time learning about all of the different things that happen in these celebrations. The children heard the story of Guy Fawkes and spoke about fire safety. We made firework pictures using glitter and we acted out stories using the Bonfire Night small world area. During the week leading up to Remembrance Day, we made poppies out of paper, we painted pictures of poppies and we wrote prayers for soldiers. When we looked at Diwali, we listened to the story of Rama and Sita and told it using small characters. We also had a real wedding and looked at all the different things that are needed to make a wonderful wedding. We had an Autumn celebration day and made hedgehog bread! Finally we learnt about the true meaning behind Christmas. We used soft toys to tell stories, we dressed up as different characters and we made Chrstmas decorations. We have really enjoyed this topic! We had lots of fun in our first half term learning about 'Ourselves'. We made self-portraits, looked after each other in the doctors area, made skeleton pictures and learnt about things we like and dislike. We used transient art materials to make our own pictures and we also used playdough to create different family members. We also enjoyed learning about 'Bears'. We learnt about different types of bears and used maps and globes to find out where they live. We also looked at fictional bear stories, including 'Goldilocks and the Three Bears', 'Brown Bear, Brown Bear' and 'We're Going on a Bear Hunt'. The children made bears out of playdough, acted out stories in the role-play area, made bears on toast and threaded bears using wool and needles. We also went on a bear hunt around our school and saw a real bear! It was very exciting!